Providing property tax relief and reforming the current property tax system is a highly visible issue. What do you believe is the best way to resolve this issue? 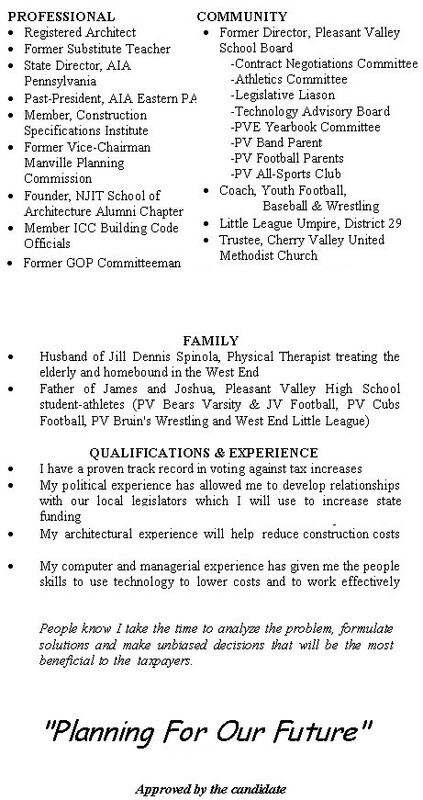 As a candidate for State Representative in 2004, my platform was based on ELIMINATING property tax and expanding state sales tax. Calculations at the time indicated expanding a sales tax to all items would generate approximately $11 billion annually. Local property taxes generated $10 billion at the time. The excess $1 billion would be used to provide rebates to senior citizens and low-income families to offset any additional sales tax they may be paying. This plan would allow education to be funded not only by residents but also by tourists who visit our community. With property taxes you never truly own your home. With a sales tax you can control how much you want to spend and therefore, how much tax you will pay. We only have so much control on the local level. We need to lobby Harrisburg to change the educational funding formula and eliminate property taxes. What distinguishes you from the other candidates? I have been the ONLY elected official to vote against ALL the tax increases proposed in the district. Tax and spend must stop and I have a proven record of voting against tax increases. I take the work of the school board seriously and will look out for the taxpayer while balancing the needs of the students. As an involved parent, a former PV school board member, a former substitute teacher, a sports coach, a musician, an architect and a taxpayer, I have the unique experience of seeing educational issues from a multifaceted perspective. I see my position as a State Rep as a steward of the community. It is a responsibility I do not take lightly. The position has the greatest influence on the taxes our community pays. We need a State Rep who can balance the needs of our citizens with the financial burden taxpayers can handle. For more information or if you have questions please contact me at pvsd@aeclinks.com. More information will be added to this site in the future so please check back often!